It's almost comical the number of nights I have spent in Hays, Kansas. It might be 5 or 6 nights now, and I cannot think of a single reason why. I was there when I was a kid with my mom and grandmother. Once my dad and I stayed at a Holiday Inn there and ate at the Chinese retaurant in the hotel; easily one of the top 5 worst meals of my life. Once I remember eating at an Applebees in Hays, and remarking to the waitress that it was really windy. "It's always like this," she said. "Where are you from?" She turned her head to the side and stared at me for a few seconds, like a confused puppy. "Then what the hell are you doing in Hays?" she asked. 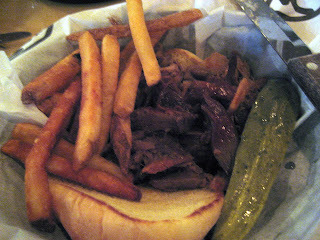 The pulled pork sandwich was not very good. They claimed it was smoked for hours over hickory, but I doubt that. There was no smoke ring and it was not tender at all. Perhaps they only cook barbecue a couple times a year, keep it in the freezer, and heat it up and serve it to the Californians passing through town, figuring we won't know any better. I would like to tell you that if you find yourself in Hays to keep driving to the next town for dinner, but that means a few hours. So if you are in Hays I guess you should probably eat here. Just don't order the barbecue.